Meeting and event planners are always searching for new event planning tips, whether it's to use for their next meeting or to simply know what others are doing so that they may validate some of their approaches. That's because meeting and event planners organize a lot of meetings, and the annual conference or congress is an excellent program that also requires a lot of meeting planning ideas. With this in mind, it seems appropriate to review some of the meeting planning ideas and event planning tips that are used by one of the profession's leading associations: Meeting Professionals International (MPI) organizes numerous conventions throughout the year. The following event planning tips are based on the MPI World Education Congress that was held in Las Vegas, August 2008. When planning a convention, meeting planners consider how to incorporate a range of emerging new technologies for the program. MPI used a fog screen. The imagined possibilities for fog screen technology, an emerging new technology, include the projection of corporate logos, messages, and other images. Event and meeting planners should know about future technologies and how/when to use them in various programs. 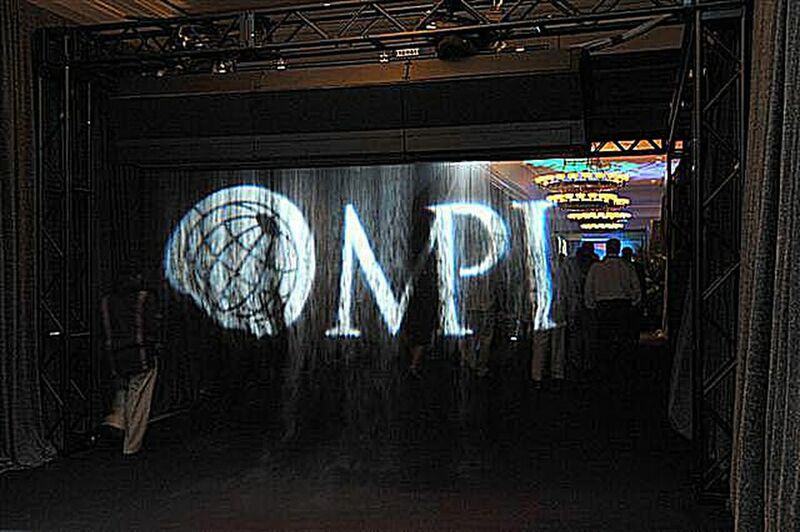 As part of the MPI WEC, 2008 opening reception sponsored by Meetings by Harrah's at Caesar's Palace, Las Vegas, attendees walked through a fog screen of the MPI logo as they entered the opening cocktail reception. Caesar's Palace's objective was to showcase how they can change the environment of a static room, explained Reina Herschdorfer, executive director of catering/conventions and events for Caesar's Palace. Fogscreen technology is an emerging technology that is dry, so attendees and guest will not walk through the fog and get wet. (c) 2008 Rob Hard / RH Communications, Inc. Venues have their event planning checklist to ensure smooth activities for special events and meetings prior to the execution of a program. As part of the event planning checklist, event and meeting planners hold a final walk-through or pre-conference ("pre-con") meeting with conference managers, including catering services. It is a time when event planners will view the production and setup progress, food and beverage, and make requests for any changes prior to the event. The venue itself also holds meetings with its staff and individuals who are responsible for the execution of the event. The executive chef at Ceasar's Palace, Las Vegas, held his meeting with chefs who were responsible for the catering services activities at the MPI WEC 2008 opening reception. Four stations were set up to serve six different hot items, and an ice sculpture serving bar was set up to serve seven different types of sushi. It's important for event planners to create special events -- including cocktail receptions -- that incorporate elements that engage the five senses. The cocktail reception at Caesar's Palace, Las Vegas, transformed a ballroom into a space that morphed throughout the evening. With a $2 million budget, planners at Caesar's and Meetings by Harrah's, Las Vegas, worked with production, design, catering experts and others to demonstrate their ability to change any environment. "We had 180 minutes of imagery and music that changed every three or four minutes," said Reina Herschdorfer, executive director of catering/conventions and events for Caesar's Palace. She also made the elements in the room interactive with the visuals on the screen. When rose petals were on the screen, rose petals also filled the room. It was also the case with the use of other special event elements, such as bubbles. It reinforced the idea of how nature and the abstract work together to create a psychedelic effect (one of Herschdorfer's goals). Herschdorfer also emphasized Caesar's intent to showcase food as an event element. "Food is art. It's about the chefs and the beauty of the food," she added. A red carpet line is a great way to make attendees feel unique and special as they arrive for meetings and other special events. A red carpet line was created by the management and staff at Mandalay Bay, Las Vegas, to welcome attendees as they approached the opening general session. It was apparent that the hour long cheering session was appreciated by attendees. And to create an element that pleasantly surprises event planners is a statement in itself. Creating a red carpet line is easier than most may think. It is simply a matter of having enough individuals who are affiliated with the event to be available during the time when guests arrive. Mandalay Bay simply put the call out to various departments by email and staff were excited to participate. To kick off conventions, leaders are expected to deliver a message about the event's meeting agenda during opening remarks during the first general session. When establishing the meeting agenda for a congress or conference, event and meeting planners need to use the opening general session to have leaders reinforce the objective and key messages of the program. For MPI WEC 2008 held at Mandalay Bay, Las Vegas, in August 2008, MacMillan highlighted the Congress' emphasis on professional knowledge, the use of technology to enrich meetings (not replace it), and his view that the industry's future will continue to grow. It's important to make sure that the message is appropriate for those who attend the event, and that it is targeted to the interests of those who attend -- including where they live. More than 4,500 attended MPI WEC, the largest attendance in MPI's history. MacMillan referenced MPI's global initiatives and provided examples of global trends. For annual conventions and congresses, it is important to have board leaders highlight past accomplishments and objectives. Organization leadership is expected to highlight past accomplishments as they set the stage for the year ahead. Angie Pfieffer, 2007-2008 chairperson for MPI, highlighted strategic imperatives that were established for MPI during her tenure. By presenting the organization accomplishments, it provides members and other interested parties an opportunity to understand key initiatives and objectives. It is relevant in all industries and meetings. It's important for meeting planners to incorporate corporate entertainment into the convention agenda -- this helps break up formal presentations. When planning a convention, it's important to incorporate elements of the local community into the theme whenever possible. Because the Congress was in Las Vegas, organizers behind MPI WEC 2008 had a full range of options. The opening general session was scheduled for two hours, so to help break up the formality of presentations, local themes and entertainment were incorporated into the agenda. Las Vegas Magician Nathan Burton entertained attendees and concluded the corporate entertainment by having 2008-2009 chairman Larry Luteran magically appear in front of the audience for his presentation. An effective opening general session should include a variety of speakers and entertainment to keep the attention of attendees, especially for longer sessions. Closing remarks for the opening general session were followed by a performance by Drum Cafe, known for providing team building and interactive drumming entertainment. Drum Cafe uses African drums and percussion to energize audiences. And, although MPI incorporated their performance, some event planners incorporate this type of performance as a hands-on experience for groups (giving attendees their drums). Drum Cafe performed for more than an hour, while some people stayed to listen and others heard the energy from the general session room as they passed the doors through the main hallway. Nearly every congress or convention incorporates a trade show or exhibition hall as part of the agenda. The expo provides an opportunity for industry suppliers and sponsors to meet with convention attendees. Traditional expos can be viewed more like a "marketplace," if conventions and conferences limit the hours when an exhibition hall is open -- and avoid scheduling educational sessions during this time -- so that exhibitors may maximize their time with important attendees. An expo will help underwrite the cost of the overall convention and provide operating revenue for association organizers. Conference organizers determine seminar topics for professional development that consider attendee skill level and development interests. MPI provided attendees with an option to schedule sessions online, categorizing sessions by skill families and audience levels. Meeting and event planners should create fundraising events as part of an annual conference or convention to maximize fundraising value. Perhaps the best way to energize a fundraising base is to hold a special fundraising event during the annual congress or convention. After all, this is the time when people have the topics and issues of the fundraising cause top of mind. For MPI WEC 2008, the fundraising event idea included an evening of food, beverages and live music at the House of Blues in Mandalay Bay, Las Vegas. The event also included the Detroit Metro Convention and Visitors Bureau as the title sponsor, as well as several other contributing sponsors to help underwrite costs. Advance ticket prices were set at $110 (USD), and onsite tickets were $125 (USD). More than 1,000 attendees joined the event -- about 25% of all attendees. Although cafe conversations may seem new to some in the events industry, these business roundtable discussions emerged from meetings in the high tech industry. Cafe conversations are informal roundtable discussions where the topics and moderators are not pre-determined, explained Brooke Bode, director of knowledge management for MPI, Dallas. "It allows attendees to learn from their peers," Bode added. Workshop facilitation is led by attendees, and offer attendees an alternative to the usual format of meeting and seminar sessions. (c) Rob Hard / RH Communications, Inc. When planning a convention, the best time to ensure attendee retention for future conventions is by promoting that message during this year. Meeting planners understand the importance of keeping attendees and/or organization members feeling that their time is well spent by attending a convention or congress. One of the goals is to make sure that attendees will return for next year's convention. MPI WEC 2008 organizers gave prime visibility to Salt Lake City, the selected host city for MPI WEC 2009. A seated lunch was served on the final day of the convention, sponsored by the Salt Lake City Convention & Visitors Bureau. It allowed Salt Lake City tourism officials to highlight competitive strengths for their destination while encouraging attendees to want to experience next year's event. This type of convention sponsorship was also valuable to Salt Lake City because they were able to make an informal pitch to all meeting professionals who happen to also be key decision makers in the selection of venues and destinations for numerous programs throughout the year. Conventions should incorporate a closing night reception, giving attendees a chance to network and discuss topics from the event. Select a fun event. Networking opportunities are as important as the professional education and exhibition hall elements of a convention or congress. Because most people tend to skip closing events, it's important that the closing night reception should leave attendees feeling excited and energized by the process -- if you want people to stay for it. Event and meeting planners should identify an event or theme that is related to the destination and location where the event is held. MPI WEC 2008 held its closing night reception at The Beach at Mandalay Bay, Las Vegas. MGM Mirage and Mandalay Bay sponsored the closing night reception for MPI WEC 2008, along with the House of Blues. Event and meeting planners should create opportunities to leverage venue sponsorships to help underwrite convention special events, including the closing night receptions. New product launches happen all the time at conventions. The key to a successful product launch is to creatively engage the attendees' imagination. With hundreds of exhibitors and suppliers attending conventions and congresses, many use this as an opportunity to promote a new product launch or re-introduce attendees to their products and services. MGM Mirage sponsored the closing night reception for MPI WEC 2008 and used the event as an opportunity to showcase the MGM CityCenter Vegas project. With a closing night reception theme around "beach party," MGM CityCenter Vegas created a sand castle replica of the project which is scheduled to open at the end of 2009.